A friend and faithful reader (thank you!) requested a post on lights to go over kitchen islands, for a modern house. I haven’t seen the image of the house design, so I am flying a little blind. But, I have picked lights here that I think could work depending on the feel you want. Without further adieu, here are my top 15 favorites. I LOVE this light. I love the simplicity of it, and the small detail of the light shining out the top near the cord. I think that distinguishes it from other similar lights, and I would choose this light for the house. While this one is typically thought to be more vintage, I think it is an interesting contrast to the modern look. I think it would add a different element to the style and design of the house, and I am a fan of mixing and matching styles. This would add a little more industrial vibe in this setting, but not so far that it wouldn’t fit. 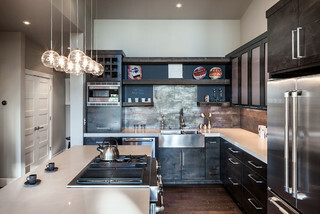 Modern glass pendants could add a little industrial feel to a modern style house. I like the Tribeca Pendant for its clean glass lines and the interest of the inner tube (a bit of a theme in the following lights). This one would be great in a kitchen with some darker accents – either darker wood cabinets, a darker countertop, or even a darker floor.  The mega bulb pendant is a real cross between modern and vintage. I like the unique shape of this light, and the double lines created by the outer glass dome, and the lightbulb (note you’ll have to find that light bulb to make it work. The Ktribe pendant is very modern in its style. I love the shape of the inner white glass, very organic and soft vs the crisp, sharp shape of the outer clear glass shade. I think this is a nice combination and could be a great light over a modern kitchen island. The Bleecker Street Pendant is aother great option for a glass pendant. From Sonneman, the cylcindrical couble glass cones are simple, sleek, and elegant. I love the unique feature of seeing the metal from which the bulb hangs. And you can have a lot of fun with this light and all the new, unique lightbulbs there are that show the filament. This pendant light comes in a few different colors of the inner bulb. I think the lines are very graceful and the light will be soft with the diffusion of the inner milk glass casing. 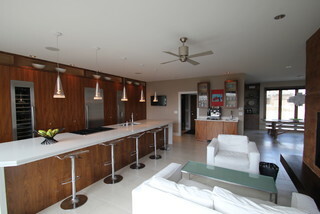 The key question for this light will be the dimensions of the island and the light, and how many of these you need. If you’re going to do more than 2 lights, I think it’s always nicest to have an odd number of fixtures in this setting. 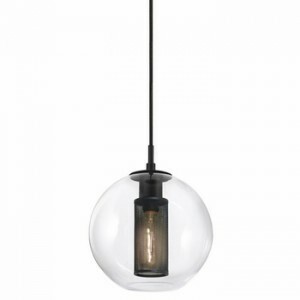 Honorable mention: I have already suggested the Echo Pendant ($370) recently in my If this was your house Part 2 post, but I think it’s so versatile and I love the warm light with the opaque inner glass tube. 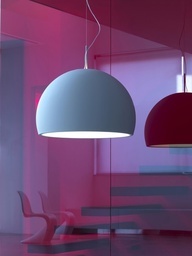 I love the soft shape of this pendant and the splash of color it would add to the space. It looks like ceramic, but it’s actually painted metal. It looks like it’s available on ylighting in Black, Grey, or sand-beige. But maybe you can get the blue by contacting ddc directly. 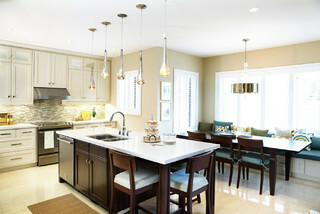 Or you could go big with linen pendants with diffusers. This is leaning a little more to a classic look, rather than purely modern but the clean lines of the linen lights is still very modern, and I think the warmth of the fabric shade would be a nice contrast to a kitchen with a lot of hard surfaces (granite or quartz countertops, acrylic finishes on cabinets, tile, etc). This is the light to go with if you want some drama in your room, and want your lights to catch the eye when someone comes into the kitchen. It is metalized on the inside, to allow the light to project a soft beam of light through the bottom glass opening. I think this would give a very cool effect, like these lights in the below image where the bottom of the light glows. I love the lines in this light, and how they give texture to the light that shines out, and a unique dimension to the pendant itself. It also comes with a diffuser on the bottom, so it will be a soft glow without the light shining in anyone’s eyes. Made of polycarbonate, it’s also tough for the kitchen. At 15” in diameter, it is on the larger size so you need fewer of them, which is nice given the price. 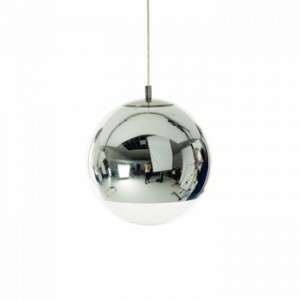 I think the simple white globe with the nickel finish is quite striking. It’s a little more classic in look, not quite as modern as some of the other choices here, but it won’t look out of place. 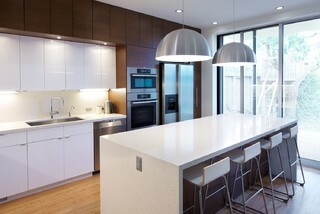 I think this glass pendant is best for someone looking for a mix of styles, or to soften a very modern space. I love the splash of color the red cord brings (orange and grey are the other options), and it’s constras with the pure white orb. It comes in two sizes (10’in diameter or 21”) so it gives you the flexibility of hanging two of the large orbs, or three of the smaller, of course all depending on how big your island is. Tip: One idea to help you figure out how many to go for. 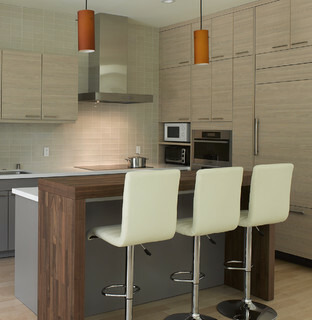 If you have the island already in your kitchen, use old cereal boxes to make lights the size of the fixtures you are considering and string or rope to hang them from the ceiling. Keep it that way for a few days, and see how it strikes you every time you come into the room. There is nothing quite like experiencing the size and spacing of the lights. If that option is not available to you, draw up a diagram of the island to scale, and then draw the fixtures in on the island (to scale and evenly spaced), and you’ll at least get a sense of the size ratio. Graph paper with squares is great for this. 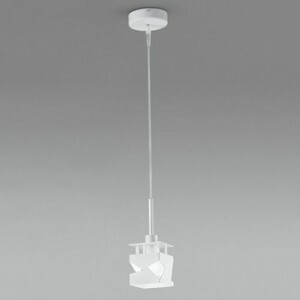 The Tilly Pendant is pretty for it’s unique shape, and how the light will come through the cut outs as well as down the bottom, so you will get downward as well as ambient light from this fixture. I haven’t seen this light in person, and it is described as having a pyrex glass diffuser on the website, so it should mean the light isn’t too direct. The final choice for this post. I like the this light for the interest the metal stems create off the rod. Coming in both Nickel and brushed bronze, you have some flexibility depending on the colors you are using in your other finishes. 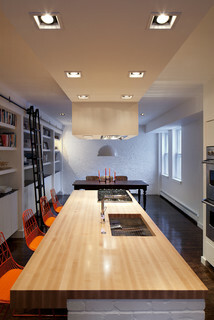 I like the mix of recessed lighting and the simple pendant over the table. I think the varying heights is interesting in this kitchen.